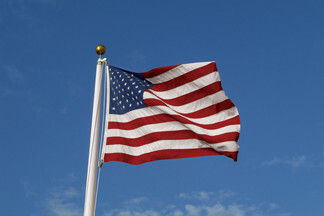 All aluminum ground set flagpoles available in 12', 18' & 22' lengths. Flagpole consists of powder coated white painted seamless aluminum tubing sections which swedge together providing a smooth exterior finish. All steel set flagpoles available in 12', 18' & 22' lengths. Flagpole consists of polyester powder coated white painted seamless steel tubing sections which swedge together providing a smooth exterior finish. All Atlas Series aluminum ground set flagpoles available in 20', 25' 30', 35' 40' & 60' lengths. Flagpole consists of clear anodized aluminum. Also available in Satin, Bronze, and Black anodized aluminum. Contact us for details.